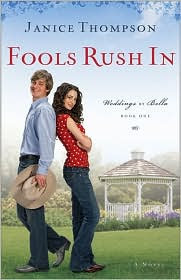 Fools Rush In, the first book in new series Weddings by Bella, is one of the best books I've read all year. Mix together an Italian family, some Tex Mex flair, some laugh out loud funny moments, and just the right dash of romance and you have Fools Rush In. Romance is generally not my favorite genre, but this book was excellent. The story goes something like this. Bella's very Italian family is now living in Texas. Her parents are ready to retire, so she is put in charge of their wedding planning business. It seems that she is a bit out of her element when the first wedding she books is a Texas country/western bash, for which she needs a DJ who can spin everything from Alan Jackson to Patsy Cline. Bella knows nothing about country music and sets of to find someone who does. Her search for the perfect DJ leads her to D.J. Neeley, who ends up being not exactly what she was looking for. Or is he? I call Fools Rush in the perfect blend of wit and romance. I enjoyed the characters, the story, and the setting. I am always pretty critical of books set in Texas, some authors get it all wrong. But, Thompson got everything right and has a really winner in the first Weddings by Bella novel. I give it two thumbs up!